La hora loca, Peruvian causas and tiraditos, Pisco sours, Fernet Branca and cola, quinoa salad, and a dessert table piled high with chocolates and sweets laced with condensed milk, all set against the backdrop of a Pacific sunset: Those were highlights from a memorable CD moments from a truly grand Peruvian-Argentinian wedding. Does the title of this post sound familiar? 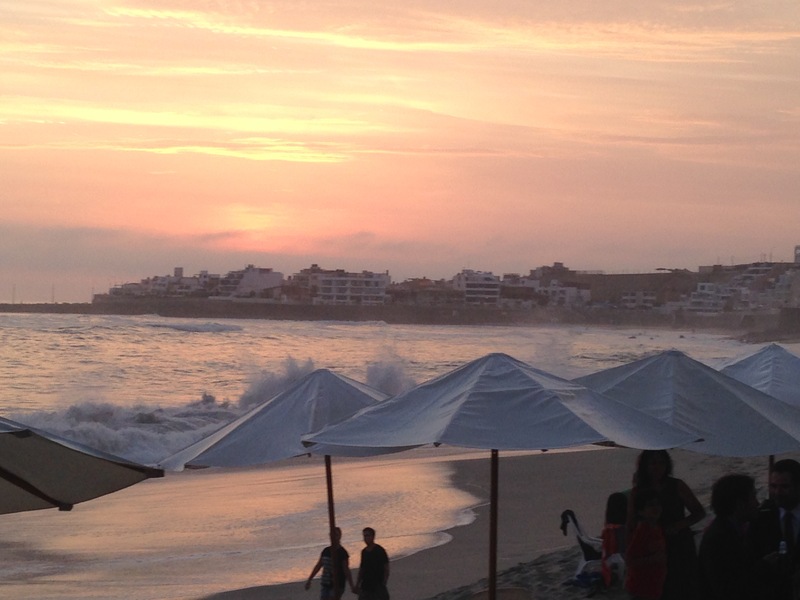 You’re not seeing double; in this post, I’ll share a wonderful cultural experience: a multicultural Argentinian-Peruvian wedding at a Peruvian beach. Breaking bread with people from other countries or cultures certainly helps bring people together, but sharing in a marriage ceremony – breaking bread, cake, and dancing – is another level altogether. Five years ago, I met a brave Peruvian soul who dared to venture to the US for an all-English language graduate program. His optimism and wicked sense of humor helped our team forge a strong bond during our two-year program. Two years ago, during that group’s first post-graduation reunion in Peru, I met his girlfriend (now wife), a poised Argentinian woman with an adventurous spirit. This great couple, M&M, guided me through a subsequent month in Peru shortly thereafter. It was only after my recent journey back to Peru for their wedding that I truly appreciated their constant assistance and impeccable English skills. M&M are fortunate to live on the beach outside of Lima, Peru. The slower pace of a surf town is the perfect setting for a for a wedding. While I expected a laid-back affair similar to American beach weddings or destination weddings, the actual wedding was an unexpected mix of the formal and informal; traditional and contemporary; Peruvian and Argentinian. The one-hour traditional Catholic ceremony was performed in a quaint seaside church. What it lacked in grandeur one would find in a cathedral, it made up for in charm with pastel peach stucco walls and simple adornments – and a jovial priest suited well for a town renowned for surfing. The wedding guests added variety and color. The men almost uniformly wore full, dark-colored suits, while the Peruvian and Argentinian women contrasted in a range of styles and bright colors reflective of the formal Peruvian and more casual Argentinian approaches to weddings. One problem, no, two: 1-the service was en español and 2-the church had no air conditioning. I know enough Spanish to be dangerous and attempt to figure out what was said – enough to make my brain hurt! We proceeded to the reception site, an oceanfront club. Assorted chilled beers and Spanish Cava awaited us. 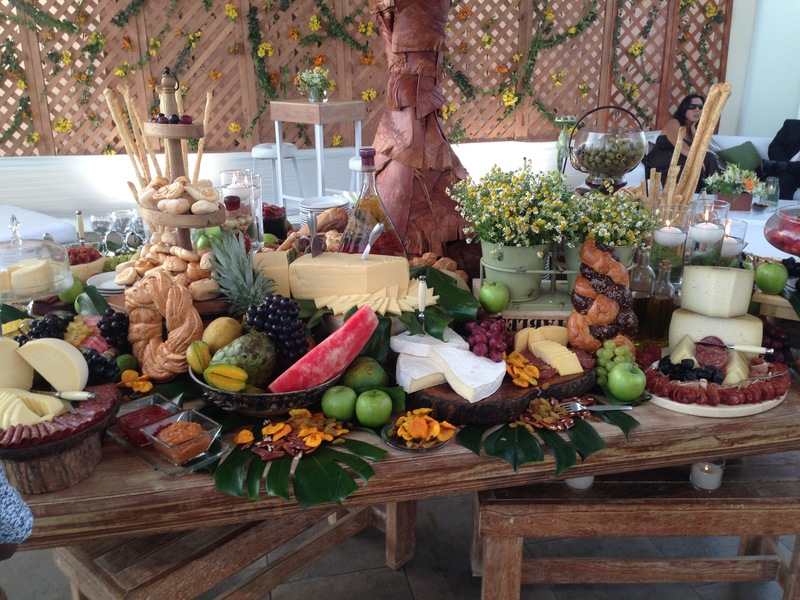 A nearby table was piled high with a stunning display of imported cheeses (from Manchego and Parmesan to Brie and bleu), breads, fresh and dried fruit, exotic marmalades and charcuterie. Upon the bride and groom’s arrival, a second – and significantly shorter – legal wedding ceremony took place at the beach club. Immediately following the signing of the municipal marriage certificate, the bride and groom began their flawless first dance, their parents entering and exiting the dance with smooth choreography. And the fiesta thus began: hour upon hour of continuous music and dancing ensued. Passed hors d’oeurves satisfied the dancing guests’ hunger until the buffet opened two hours later. Traditional Peruvian favorites, such as causas de cangrejo (a Peruvian specialty consisting of puréed or mashed potatoes filled or topped with seafood – in this case, cangrejo, or crab); brochettes (skewers) of lomo (beef), topped with a vanilla and Aguaymanto chutney; a white fish tiradito (ceviche without onion); shrimp tempura; tuna tartare; stuffed mushrooms; and other small bites to help offset the ample bar. The bar’s offerings were representative of the bride and groom’s heritage. 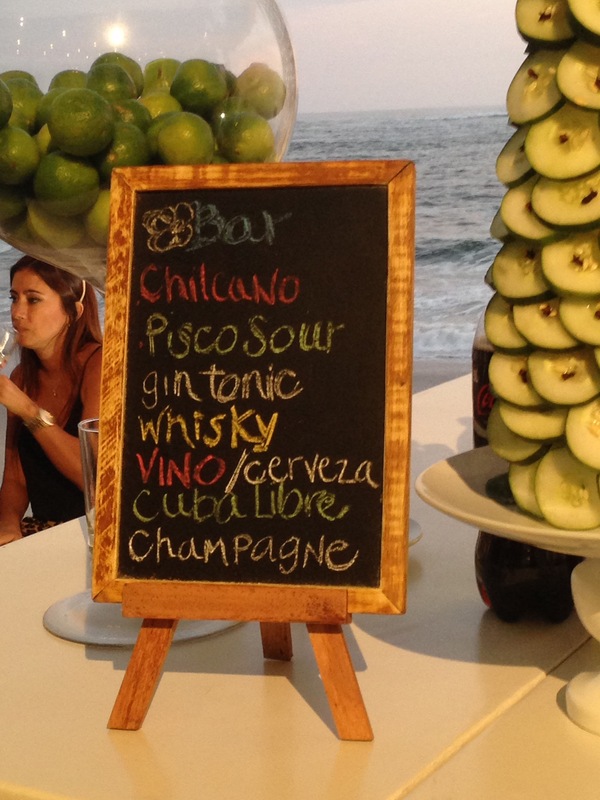 Peruvian Pisco cocktails – the well-known Pisco Sour and the Chilcano contrasted with the Fernet Branca provided for the Argentinians to mix with cola (a combo really only Argentinians would love! Kidding, sort of!) Argentinian Chardonnay and Malbèc wines represented the great reputation of Argentina’s wine country, particularly Mendoza. For me, it was a surreal moment when I, an American, explained the Chilcano to an Argentinian guest. Chilcanos – traditionally a combination of Pisco, ginger ale, lime juice and Amaro bitters – have a special place in my heart and memories of my previous trips to Peru. #honoraryPeruvian #Groanhashtag! With so much drinking and dancing, a full meal was a requirement. The main buffet featured international foods – crab and cheese ravioli, Camembert and caramelized onion tart, roast beef, salmon, cold quinoa pilaf, and ensalada Huerta peruana (a Peruvian succotash of Lima bean, artichoke, corn and cheese salad) were hearty enough to sustain my – I mean everyone else’s – dancing. I knew that the two dessert tables would be my own weakness. Beautifully molded chocolate truffles, marzipan, condensed milk bonbons, and dark and white chocolate and hazelnut pyramids were spread artfully, mingled with various puddings, including lucuma mousse (read my post from last week for more in lucuma) and a suspiro de limón – a light custard bearing the distinct caramel sweetness of condensed milk and a hint of lime, and topped with merengue. The suspiro was a bit too sweet for my tastes, so I could not finish it. But I was in chocolate heaven otherwise – especially pairing gran marnier truffles with a bit of Malbèc. The food and drink were wonderful, but the truly memorable experience of the night was La Hora Loca (Crazy Hour), a Peruvian tradition. For us Americans and Argentinians, it was a wondrous novelty. Allow me to explain. Every couple picks a surprise theme, and colorful props, masks, and music turn a party into a fantasy. This Hora Loca’s theme was appropriate – beach and surf. The hour began with the launch of confetti cannons to the song “Wipeout”. A parade of costumes – a shark, a surfer, and others came out. Shark hats, plastic flower headbands, beach balls, princess wands, and other props suddenly appeared on and in the hands of the crowd. A retro conga line materialized to the sounds of the Beach Boys. The mood, already up tempo, became light, like cotton candy. I couldn’t help but see this moment as a reenactment of Katy Perry’s Super Bowl 49 halftime show in 2015 (does anyone remember the dancing sharks?). I mentioned that resemblance later to the bride and groom, and the blank looks on their faces indicated that was a happy coincidence. Nevertheless, this fantasy environment brought three countries and regional cultures together. Levity, music, and dance were our common language. Lest anyone think La Hora Loca was the reception’s grand finale, the party was at that time closer to its infancy. While I couldn’t make it much past midnight, I heard the party continued until almost 3 am – a commonality in South America. It’s a far cry from the structured 3-4 hour blocks of the typical U.S. reception venue. It was a truly memorable cultural exchange for me and a perfect celebration of life and love between two of my dearest friends!